Given the one-party rule in the nation’s capital these days, one might have expected a smooth roll-out of top priorities for Betsy DeVos, the country’s controversial education secretary under President Donald Trump. But things are, quite clearly, more complicated than that—particularly when it comes to DeVos’ relationship with federal lawmakers in her own party, as Education Week explained in a new report Monday. It’s been a rough month for DeVos, a wealthy, GOP booster whose uncomfortable interview with “60 Minutes” correspondent Lesley Stahl, broadcast two weeks ago, has become fresh fodder for Trump and DeVos’ harshest critics. Now it’s clear that the education secretary—who’s reportedly “alarmed” officials in the White House with her performance on the CBS news program—is struggling to implement her vision on Capitol Hill. Of course, according to the report, such tension isn’t unheard of when it comes to the nation’s top K-12 policymakers. 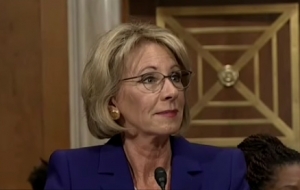 U.S. Secretary of Education Betsy DeVos is frustrated with Congress these days. And it appears the feeling is mutual. But she’s hardly the first education secretary to clash with lawmakers in her own party,over the department’s budget, policy direction, and more. DeVos, who lead the American Federation for Children before becoming secretary, has spent her career doling out millions in campaign donations, mostly to GOP candidates, and many of them members of Congress. But that hasn’t stopped lawmakers from largely rejecting her proposals,including cuts to the agency’s bottom-line, a new private school choice program, and new federal resources for public school choice. Congress—which is controlled by Republicans—also put language in the recently enacted spending bill that would block DeVos from moving forward on a reorganization of the department’s budget office, which arguably interacts with Capitol Hill more than any other arm of the department. What’s more, during a recent budget hearing, Rep. Tom Cole, R-Okla., the chairman of the House appropriations subcommittee that oversees K-12 spending, said he doesn’t understand why DeVos reupped her ask for choice programs that Congress was already poised to nix. Meanwhile, Rep. Rodney Frelinghuysen, R-N.J., the chairman of the House appropriations committee, chided DeVos about the lack of coordination and communication between House staff and her department—a problem he said he’s had with Secretary of Commerce Wilbur Ross’ staff as well. Michele McLaughlin, the president of the Knowledge Alliance, which advocates for using research in policy and practice and a one-time aide to former Sen. Tom Harkin, D-Iowa, said it’s not a big surprise that Republicans in Congress weren’t taken with DeVos’ budget pitches. Both Cole and Sen. Roy Blunt, R-Mo., who oversees education appropriations in the Senate, represent relatively rural states where school choice often doesn’t get the traction it does elsewhere. One Republican source noted that, as a major GOP donor, DeVos had long-standing relationships with congressional leaders, including House Speaker Paul Ryan. The source is surprised that those lawmakers haven’t done more to defend her. To be sure, GOP lawmakers have stepped in to support her. For example, Rep. Andy Harris, R-Md., defended the secretary against Democratic attacks at last week’s hearing, saying he supported her move to consider changes to Obama-era discipline guidance. DeVos, too, hasn’t exactly been brimming with praise for the Hill. One of her biggest complaints: The Senate has been achingly slow to confirm the president’s nominees for key positions at the department.